Chicago Teachers Union members who were expecting to vote on Nov. 5 on their willingness to strike were instead given the CTU's "Contract Poll Practice Vote" handout that asked four lengthy questions, confusing voters and angering many in the high schools. Steinmetz CTU delegate Bernie Eshoo asks CTU Staff Coordinator Jackson Potter to explain the Nov. 5 "Contract Poll Practice Vote" ballot. At Steinmetz High School, 3030 N. Mobile, union members were annoyed by the questions that took a long time to read and were difficult to comprehend first thing in the morning. Teachers said they were angry that they didn't receive a ballot that asked about striking. "It was never supposed to be a strike vote," CTU recording secretary Kristine Mayle told Substance. "It was a practice run to make sure that the mechanisms were in place to make sure we can surpass the 75 percent when we need to." The ballots were distributed to school delegates at the CTU House of Delegates meeting on Nov. 4. After Steinmetz delegate Bernie Eshoo saw the questions she immediately looked for an explanation from union staff. 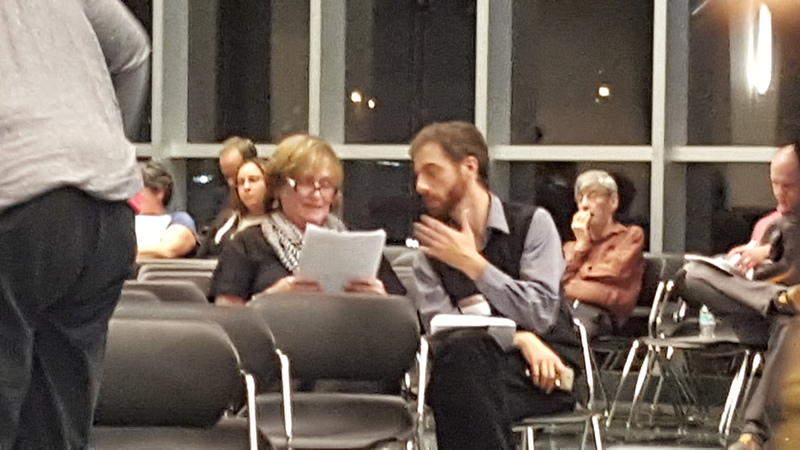 CTU Staff Coordinator Jackson Potter attempted to convince Ms. Eshoo of their value. 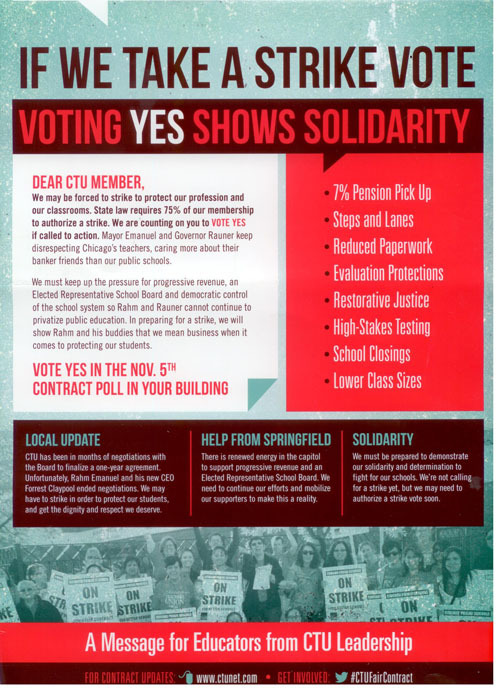 In contrast to the Nov. 5 ballot, a CTU mailing advertised the city-wide poll as a "call to action" and strike authorization vote. Rank and file Rules-Elections Committee members had not seen the questions prior to the House of Delegates meeting. Mayle said that several union staff members had crafted the questions. "We wanted to use the questions to educate members and remind them of contract demands," she said. While many union members at Steinmetz and Senn high schools complained about the length and difficulty of the questions, Mayle said she hadn't heard those complaints from other schools. The city-wide count of ballots will be held at the union offices on Nov. 6. The Chicago Teachers Union and the Board of Education are in ongoing negotiations over our next contract and remain far apart on many issues. Indicate your choice by putting an X in the appropriate box. 1) In negotiations, Board of Education negotiators demand that CTU members agree to pay cuts, increased health care charges, elimination of minimum staffing levels and contract changes which will remove hundreds of CPS employees from our schools to help balance the Board's budget. CTU's Bargaining Team categorically rejects these proposals. Do you agree with the bargaining team? 2) The Mayor and Board of Ed refuse to stand up to corporations like Bank of America and to super rich individuals like Bruce Rauner who underfund our schools by refusing to pay their fair share in taxes. Should CTU highlight the real cause of CPS budget challenges by organizing boycotts, corporate campaigns and legislative efforts to retrieve that money? 3) Forrest Claypool, Rahm's hand-picked CEO, has earned a reputation as a privatizer and an anti-union manager at the Chicago Park District and the Chicago Transit Authority. He supports school vouchers, charter school expansion, and has made massive cuts to special education and is threatening 5,000 layoffs. Do you support a vote of no-confidence in Forrest Claypool as CEO of the Chicago Public Schools? 4) CTU's demands include: A librarian, nurse, art, music, and PE teacher in every school, expansion of Early Childhood programs, funded homeless and restorative justice coordinators, strengthening of special education, grievable class size limits, a minimum wage of $15 an hours for all Board employees, limitations on paperwork, improvements to the evaluation system, protection for paraprofessionals, and an expansion of the Grow Your Own program which supports community members who become teachers. Do you support these demands which will strengthen our schools and provide better programming to meet the needs of all students? Most Chicago Teachers Union members expected a rather straightforward question as to whether they were willing to go on strike this school year. Instead, the document they received to "vote" on turned out of be the equivalent of a push poll, asking questions only vaguely related to whether the members are ready to strike in the face of the budget claims of CPS. This is the ballot people got to vote on on November 5, 2015.Many union members in the network and central offices weren't able to vote because the polling logistics hadn't been worked out by union officials. Under current Illinois law, the CTU must get 75 percent of all members in order to do a legal strike. "This is the whole point � to find those problems so we can fix them before it becomes a real vote," Mayle said. "We can plan ahead and prepare the materials for all voters, because now they've been identified. In addition, it shows which schools have strong delegates, who were able to get this done, quickly and efficiently, and which schools need a little more help." Members at my school were surprised, in fact I was as well when I first saw the poll at HoD. However, the purpose was fulfilled. I understand some teachers were unhappy that this wasn't an easy check a box yes or no. But members are bending over backwards, jumping through hoops on a daily basis to meet the ridiculous mandates of their network chiefs and the BOE. Yes, this took some time to read and digest. So I joked that you need your highlighter and pen to do a close read of the questions. Fact of the matter, we got the job done! Sorry for the members who were so upset and inconvenienced. At my school many teachers appreciated the info contained with the poll and it sparked a great deal of discussion. This "poll" does not reflect the urgency of the situation. I can appreciate the idea behind the poll but it was not what was expected. It was weak. Many of my fellow colleagues were questioning why the language did not speak to taking action. We are exhausted from playing the waiting game. I think it is vital that the leadership takes note of the frustration being expressed by union members as a result of this "poll". We as a union need to get tough and begin the process of taking action sooner rather later. The energy of the union seems unfocused. Last time in 2012, there was a clear message which was targeted directly at Rham. This time the CTU's message has elements of showcasing various problems of CPS couples with mild attacks on Claypool and Rham. These messages do not appear to be for the public but to appease rank and file along with satisfying requirements that some type of bargaining is going on. It seems CTU and CPS are making the appearance that negotiations have stalled and both sides cannot compromise. This is the image sold in the media. However it appears some deal was made to combine forces at the state level. It is predictable that no contract will be agreed upon until the State budget issues are resolved. The polarization between CPS and CTU is merely a show this time around as the real enemy to both is in Springfield. Both sides are active in getting the state to provide more money, which would be a win for both. However this recent poll appeared to be a massage to an anxious rank and file that the CTU is doing something while waiting for results in Springfield. I agree with Jennifer Egan, we need our Union to emphasize a sense of urgency, and expected it from the Practice Strike Vote. Members at TEAM Englewood and Hubbard high schools were confused and disappointed with the questions. We wanted to see questions that would result in a response of "HELL, YEAH!! ", not "ummm...what are they asking here?...oh..." Our associate delegate astutely anticipated the problem, and emailed the questions to staff in advance. We also ended up adding our own, clear, strike question, because members demanded it. This happened with the last strike poll as well: the union asked fpir propaganda style questions, and didn't ask about a strike. "Many members were annoyed by questions that took a long time to read and were difficult to comprehend first thing in the morning..." These sound like typical responses from students when faced with challenging material. While this vote should have been billed as a referendum on the issues surrounding our wages (the only legal issue we can strike over), complaining about spending 5 - 7 minutes reading information pertaining to the possibility of a work stoppage seems like time well spent. And, hopefully a significant number of no votes to question 2 will let CTU know the need to justify what appears to be a misguided strategy of pitting everyone against Uncle Pennybags. I wish the CTU had added this. "We will not return to work until Senate Bill 7 is revoked." Since we cannot, by law, negotiate anything except wages this poll is absurd. I get the frustration and the CTU could have done a better job anticipating the confusion and shared questions with delegates in advance as to avoid confusion. However, as Ed Hershey notes this is the same method we used in 2012. We did not ask a direct question about a strike in the practice vote then. The idea here is to educate about the central issues. What we have found is many members had not had these conversations up to the vote about what issues were at stake. Let's make sure to strengthen our resolve over the next weeks and months so everyone is fully aware of the issues and unify around our shared goals! With all the questions during the past week, a major fact is that the November 4, 2015 meeting of the Chicago Teachers Union House of Delegates had a massive turnout -- possibly the largest in 20 or 25 years. This is an indicate of the union's leadership base. The issues raised about how to deal with the "educational" questions raised by the poll questions is also about how to train delegates on the major duties of the union in the school: Union Power based on solidarity and the creative use of the contract. The big three are always (a) the PPC meetings, (b) the union bulletin board's updates, and (c) the monthly union meetings for all union members (which requires some work because of differing schedules). Without denigrating the importance of emails, the Web, and "social media," the traditional ways of communications, all based on face-to-face work with our union brothers and sisters, are unsurpassed in doing these things. One of the problems with the four questions on the November 5 "strike vote" is that any and all of them could have been expanded almost to infinity, because they are based on economic class issues -- a plutocracy versus the working class, with the Chicago Teachers Union at the hub of much working class militancy. Here is just one example: While Bank of America is explicitly noted in one of the questions, the "toxic swaps" (actually, as we first exposed here at Substance and in our budget studies jointly through Substance and CORE, "variable rate bond issues" which were illegal) involved not only Bank of America, but Royal Bank of Canada, State Street Partners, and other "banks". While there is some agitprop reason for focusing on Bank of America as one bad guy (and the union has voted to "boycott" Bank of America), in fact were were looking at a conspiracy of some banks and bankers (David Vitale, joined by Arne Duncan when the swaps were begun in 2003) to screw CPS -- and all of us. So, it may or may not be wise to focus on "Bank of America" because the actual history is of the banks screwing CPS -- all the way back to the last "School Financial Crisis" when Continental Illinois Bank helped engineer the 1979 "financial crisis" and usher in the School Finance Authority. These questions need lengthy discussion and debate, based on some facts of history and information. But a major fact is that all of the current plutocratic players in the November 2015 melodrama facing us in Chicago could disappear tomorrow and they would simply be replaced by others, since we are facing class issues and not just Raucous Rahm, Big Bad Bruce, and Ferocious Forrest. While it may be useful for some purposes to do stand up against the current faces across the table, let's never forget that they are interchangeable parts in this struggle. One year ago, in November 2014, Barbara Byrd Bennett, Tracy Martin (Thompson), Sherry Ulery, and Tim Cawley were big names for those who wanted to play stand up games. Ten years ago there was Michael Scott and Arne Duncan. Regular PPC and grievance work to strengthen the union at the local school, regular communications (especially the bulletin board and monthly meetings) and lots of personal work are always going to help. But we can never (as in NEVER) pose questions that wind up distracting union members from the reality. After all, less than ten years ago, some people wore tee shirts that read "End Renaissance 2010..." Wow! We won that one, ousted Richard M. Daley - and what? With all due respect to Mr Potter The "Central Issues" mean different things to each school.And to be honest with you George I have no idea what a toxic swap is, let alone how it works. I am aware, however, of how my small circle of teacher friends are fairing. To them our union is just an abstract term, like toxic swap.they are being crushed by factors the union has been ignoring.Until SB 7 and its prohibition against bargaining over management rules is revoked our union is a debating society. I was surprised to read people critical of the CTU practice strike poll. Teachers do need to stop and actually read something. Many do not attend union meetings or are active. The fact that they had to stop, read and think a little about the big picture, and not just vote up or down to a strike, is laying the groundwork. Similar idea behind the referendum on the elected school board. Voting yes to that did not mean the city could implement the voters wishes. It "educated" them, and showed the city that is want the voters want. My teachers had no problem, and those who wanted to read the questions versus asking me how to vote, was a good thing in my book. PS Kudos to Sharon for writing a well-balanced story. "The law keeps us from asking questions twice, so what we do is we ask a series of questions that cover the four corners of our bargaining proposals," he said. "Really what we're saying is we're trying to stake out the four corners of our bargaining positions and check the sentiment of that in our schools." This makes sense, as far as it goes. Now why couldn't they just tell us this at House of Delegates BEFORE the vote, eh?